The Yorkshire Terrier is the most popular small dog breed in the United States. It's often called by its nickname the Yorkie. 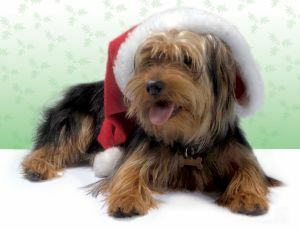 The American Kennel Club classifies the Yorkie as a Toy dog, but also agrees that it is a terrier. Where to Yorkshire Terriers come from? Well, Yorkshire, of course! To be more specific they originated from Yorkshire, England where they were first bred to kill rats in clothing mills. In the 1860s there was a famous Yorkshire Terrier named Huddersfield Ben. He was a popular Paisley Terrier at the time and he became the definition for the Yorkshire Terrier breed type. They are a small dog that only weighs four to seven pounds. The coat is probably the most defining feature of the Yorkshire Terrier. The hair is straight, fine, and shiny and is often grown out long and then parted down the middle of the back. The back of the coat is often a dark grey that turns tan around the middle, legs, and face of the dog. If the hair is kept long it must be brushed regularly. Some owners keep the hair clipped short. Yorkshire Terriers do not shed very much as well. This can make them good pets for people who are somewhat allergic to dogs. Sometimes they are said to be hypoallergenic. These small dogs are active and bold. They can be good pets and companions, but need to be trained not to bark too much. They also tend not to like walking on a leash and can be difficult to house break. Is it the same as a Silky Terrier? No, they are different dog breeds, however, they are quite similar too. The Silky is larger at 10 pounds vs. seven. Silky Terriers tend to be more independent as well. A lot of famous celebrities own Yorkshire Terriers such as Paris Hilton, Brett Favre, Brittney Spears, and Justin Timberlake. They are the most popular toy dog breed. This breed was recognized by the American Kennel Club in 1885. Sometimes they are mixed with poodles to come up with the mixed breed Yorkie-poo. Their lifespan is typically from 13 to 16 years. The smallest dog in recorded history was a Yorkie named Sylvia. She was 2 1/2 inches tall at the shoulder and weighed 4 ounces.